Max is a lonely kid with a big imagination. Most days his imagination and energy serve him well. Whether it's sailing a boat across the high seas of his bed sheets or building a snow fort and ordering around his fence army, Max keeps himself pretty entertained. Unfortunately everyone needs a friend and Max's mom and sister seem to be too busy most of the time to remember Max. Although, his mom tries to make time for her son she is trying to single-handedly run a household and business. One night Max runs away and finds a boat. His boat. A boat that leads him to where the wild things are and where adventure will unfold. 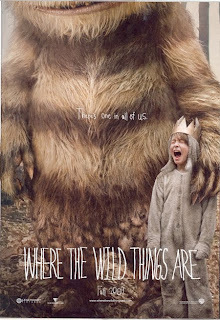 Where the Wild Things Are has been around since 1963 and this is the first attempt at a live-action film adaptation. The book has many fans that span many generations and a film version was going to have to play to old and young fans alike. Needless to say, Where the Wild Things Are was going to be an ambitious project no matter who was behind the camera. Fortunately for us, the wonderful Spike Jonze put his heart and soul into this project and it shows. If there is one thing that makes this film stand out it is the amount of care that went into every detail here. That's what makes it work so well. Instead of just haphazardly throwing a plot together and making some cool looking monsters, the writers spent time and effort on making an engaging story along with some incredible looking monsters and insanely fun and exciting sequences. This is a film that delivers on every expectation I had and then some. The monsters are all incredibly sympathetic characters and there is a sadness in their eyes that brings a real genuineness to them. This would be a terrible review if I didn't mention the outstanding Max Records as Max. Most of this movie working relied on his performance and he knocks it out of the park! I could seriously spend the rest of my review gushing on how fantastic this kid is. However, I'll cut to the chase. Records is probably going to get nominated for an Oscar. And he is probably going to have a real shot at it. What makes his performance outstanding is that he wasn't really told to act and be scripted. He was simply being a kid. I bet he had a blast running around building snow forts and having epic dirt-clod wars with the wild things. Where the Wild Things Are is exactly what you were expecting. Charming, engaging, intelligent, heartbreaking, hilarious, exhilarating and most of all nostalgic. If you remember reading this book as a child you will get chills during some of the sequences as this rush of memories comes flooding back. I just got them from typing this review. Also, if you plan on seeing this with the little ones, you might want to re-consider. It's not terribly scary, it would just be boring for them. The film is on the slow side and deals with some pretty heavy stuff at times. Kids in our theater were getting fidgety when the excitement slowed down. This was a really great review and now i expect the best out of this movie. What other movies has Spike Jonze directed? The only other movies he's done are Being John Malkovich and Adaptation (both great. I own Adaptation) They were both written by the guy that wrote Eternal Sunshine of the Spotless Mind. Spike didn't direct that one though. Outside of those two movies he's been responsible for some AMAZING music videos. Weezer's Buddy Holly and Fatboy Slim's Weapon of Choice are two of my favorites.